I uploaded this shot and four others to the South Mountain Sunset set on my Flickr site. Be sure to drop by there and see the entire group of images, all done in HDR using Photomatix and Paintshop Pro. I still have more shots to process, and then it will be time to start planning my next shoot. We had our first dust storm of the monsoon season this past week, and it would be really cool if I could capture one of those monsters from the top of South Mountain as it moves across the Valley. Not very likely, but it would be quite interesting. Regardless, we do get some brilliant sunsets and sunrises this time of the year as there is so much dust and ozone in the air….not great for breathing but sure makes some great photos! This entry was posted in Processing, Shooting and tagged Arizona, AZ, cloud, D5000, desert, HDR, Nikon, Paint Shop Pro, photography, Photomatix, software, sunset. Bookmark the permalink. 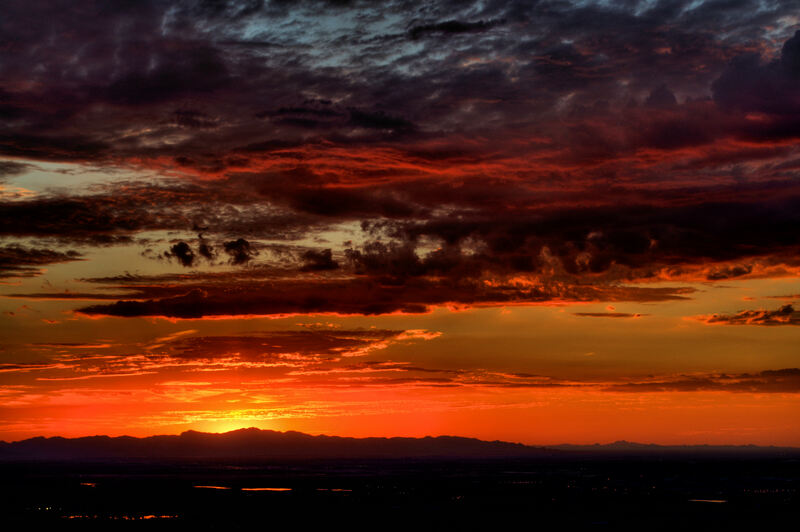 ← South Mountain Sunset – HDR or not?